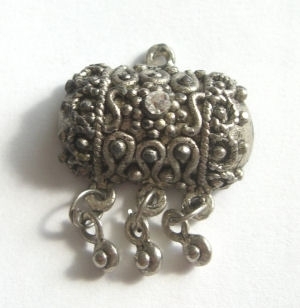 Gorgeous vintage little silver pendant. This super unusual pendant is 20mm x 15mm and has really lovely silver worked on the top in a fancy and intricate pattern all raised. In the middle is a really nice shiny crystal and at the bottom of the pendant hangs three little dangles. This pendant can be used on its own as a focal on a chain or could be nicely incorporated into a design with other beads.